Sometime during college in Austin in the 1970s, I took a photography class. For one of the projects, I photodocumented the visual chaos created by the myriad of telephone poles and electrical wires strung throughout the city. Wow - there is so much visual pollution in our cities. Poles that are at different angles with all sorts of wires draped from one to the next, transformers, phone lines, etc. In the country, telephone poles and cables strung along makes some sense. But, many communities and housing developments are now requiring utilities to be buried. That helps the visual ugliness, but it makes it difficult to access the utilities - utilities must be located under the ground and then yards must be dug up. But in the city - there's got to be a better way. A large utility box buried in the ground along streets contains all utilities. The lid of the box serves as a sidewalk. All utilities are buried out of sight - no telephone poles with electricity, cable nor phone lines. Now its all underground. Placing all the utilities in the box allows easy access for repair, maintenance, and additions of new utilities. No more digging up the yard or street to get to buried utilities. The box has ample room for additional utilities - planning ahead for technologies that may come. Who thought about stringing television cable in naberhoods a few years ago? The box is prefab concrete in open-ended sections about 6 feet long. These are placed in trenches and aligned with each other and with the topography of the surrounding yard. Along one side, away from the street, is a steel brace that supports the lid and the chases for the utilities. There are holes in the steel brace to accommodate flexible water lines and electrical conduit. Wiring chases or shelves are supported by the steel brace and run the whole length of the conduit. 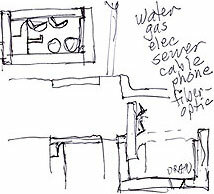 Wires, television cable, phone lines, etc. can be laid into these shelves. The sidewalk lid rotates up and into a cavity in the steel braces. There are no moving parts to wear out - no hinges, pistons, or lifting mechanisms. The lids are too heavy for anyone to lift - it requires a hoist on a truck that travels down the street lifting the lids long enough for a crew to add or repair utilities in the conduit. On the floor of the conduit box are braces to support water and sewer lines. 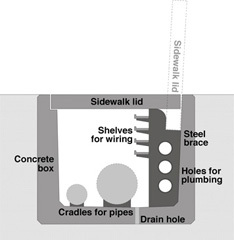 Periodic holes allow rainwater to drain into the sand and soil base under the boxes. With the utilities inside and protected within the box, there is no need for telephone poles.